The event will feature popular comedian (and gay parent) Judy Gold and a lineup of top gay and gay-friendly comedians as part of the monthly benefit program at Gotham Club called "Alyse Kenny Presents...It's A Charity Thing!". Admission is only $25 or $50 for VIP Seating (2 drink min.). Advance booking is required. Past shows have sold out quickly! We highly recommend buying tix as soon as possible! Many of you asked to arrange for social activities for gay parents and future parents, and even more urgently we all recognize the need to help those among us who cannot afford the high costs of surrogacy and egg donation. On October 1 we should all get babysitters if needed, and come together for this fun community event, and bring as many of our friends along!! We will have terrific raffle prizes as well: two Broadway tickets (courtesy of BJ Holt), a $100 gift certificate to the Bogota Latin Bistro restaurant (thank you George Constantinou and Farid Ali Lancheros! ), and a set that includes a voucher for a free night of baby nursing services and a $100 gift card from Chapman Hill Baby, a baby nursing service and an online baby supplies and toy store. 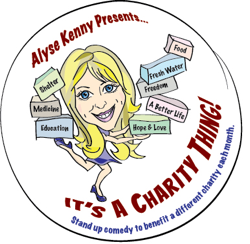 "Alyse Kenny Presents...It's A Charity Thing!" * ADVANCE TICKETS ARE REQUIRED! PAST SHOWS HAVE SOLD OUT! WE HIGHLY RECOMMEND GETTING TIX ASAP! Help us promote the event!! Download a flyer or postcard to print and distribute around your neighborhood! Announcing an October 1st comedy fundraiser in NY for Men Having Babies with Judy Gold and a lineup of other top comedians! Come help raise money for the new Gay Parenting Financial Assistance Fund! This will also be a unique community celebration for gay dads, future dads and our allies. Get your ticket TODAY!